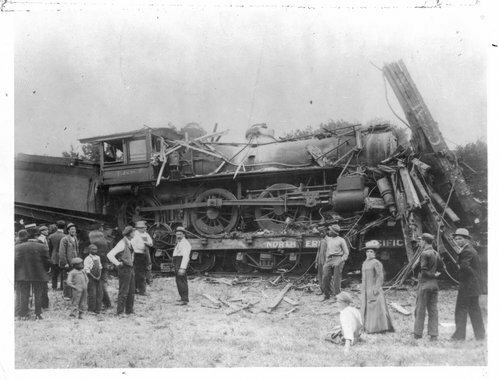 These black and white photographs show the wreckage between two Atchison, Topeka & Santa Fe Railway locomotives east of north Topeka, Kansas. The accident occurred when oil train #185 collided into the construction train that was pulling six flat cars near the Kaw Valley school house about 2 miles north of the three bridge over Soldier Creek. At the time of the collision, there were approximately 60 to 70 section workers aboard the construction train. Many of the workers either escaped to safety or were severely injured, but seventeen of them were pronounced dead at the scene.